Colin Todhunter wonders if vegetarianism is just a passing fad, a trend, or if it actually benefits our health and environment. In many parts of the world, tucking into a succulent morsel of meat is one of life’s greatest pleasures. And the more affluent a person is, the more likely it is they will eat more meat. But a trend suggests a move away from meat eating is gaining momentum, and it’s not just because of the cruelty involved in its production or the various well-documented health risks associated with eating red meat. It’s because the modern method of meat production is a major contributory factor in global warming and environmental degradation. When global warming is mentioned, most people envisage oil refineries, coal-fired powered plants, cars or smoke belching factories wreaking havoc with the planet. But livestock is responsible for 18 per cent of greenhouse gases, more than cars, planes and all other forms of transport put together, according to the United Nations’ Food and Agriculture Organisation. It could well be the case that going vegetarian may be the easiest and quickest way to lower your carbon footprint, reduce pollution, and save energy and water. Dr Rajendra Pachauri, chair of the United Nations Intergovernmental Panel on Climate Change, certainly thinks so. He is an Indian economist and says that reducing or cutting out meat entirely is one of the most important personal choices we can make to address climate change. While vegetarianism in some countries was once regarded as a fad or a luxury, Dr Pachauri implies it is fast becoming a necessity. The amount of meat humans eat is immense. In 1965, 10 billion livestock animals were slaughtered each year. Today, that number is 55 billion. More chickens are killed in the US every year than there are people in the world, and there are one billion cattle alive, weighing twice as much as the human population. All that livestock needs land, which places pressure on wildlife habitat and forest. Livestock is the world’s largest land user. Grazing occupies 26 per cent of the earth’s ice-free terrestrial surface, and feed crop production uses about one third of all arable land. And what about all that manure? In traditional, sustainable systems of agriculture, manure is part of a holistic cycle: it’s fertiliser. But in modern agriculture, this waste is not cycled through the farm because there’s just too much of it. Instead, waste is stored in manure “lagoons,” which emit methane and, even worse, nitrous oxide. Meat production requires staggering amounts of land, water, and energy, as compared to plant foods. A 2010 UN report explained that western-type dietary preferences for meat would be unsustainable in future, given that the world population is forecast to rise to 9.1 billion by 2050. Demand for meat is expected to double by this date, and meat consumption is already steadily rising in countries such as China, which once followed more sustainable, vegetable-based diets. 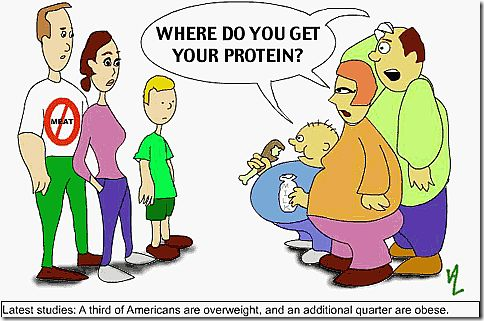 A person existing mainly on animal protein requires ten times more land to provide adequate food than someone living on vegetable sources of protein. Far more energy is put into animals per unit of food than for any plant crop because cattle consume 16 times as much grain as they produce as meat. It takes 16 pounds of grain to make one pound of beef. Animal farms use nearly 40 per cent of the world’s total grain production. In the US, nearly 70 per cent of grain production is fed to livestock. If humans continue to eat more and more meat, it means we’re not just going to use far more land and water, but we’re also going to manufacture much more chemical fertilisers and pesticides. We will thus be creating far more pollution and greenhouse gases. Modern farming (both meat and non-meat production) is heavily dependent on chemicals, which leads to the emission of the major greenhouses gases: carbon dioxide from the use of fossil fuels for machinery and to produce the chemicals needed, nitrogen oxide (300 times more potent than carbon dioxide) from the use of chemical fertilisers and methane (animal flatulence) from factory farming. It has been estimated that livestock contribute to about 9 per cent of total human related carbon dioxide emissions, 37 per cent of methane emissions and 65 per cent of nitrous oxide emissions. This includes carbon dioxide emission from deforestation in Central and South America, attributed to livestock production. Factor in that a gallon of gasoline is used to produce a mere pound of grain-fed beef, and you begin to appreciate that meat production is a very fossil fuel, resource-intensive industry. Scientists at Cornell University have advised that the US could feed 800 million people with the grain that livestock eat. Meat production also places a great strain on fresh water, which is likely to become an increasingly scarce resource in the coming years. John Anthony Allan, professor at the University of London’s School of Oriental and African Studies, argues that the average meat-eating US citizen consumes five cubic meters of water compared to half of that which vegetarians consume. But not all meat is equally water-intensive. He says that beef requires 15,500 litres of water per kilogram compared to chicken, which needs 3,900 litres per kilogram. So, at the very least, consumers could think about reducing their beef consumption since it requires the most unsustainable water footprint. In her book, Stolen Harvests, environmentalist Vandana Shiva says that for every pound of red meat, poultry, eggs and milk produced, farm fields lose about five pounds of irreplaceable top soil. She also states that the water necessary for meat breeding comes to about 190 gallons per animal per day, or ten times what a normal Indian family is supposed to use in one day, if it gets water at all. This is a salutary reminder of what other countries may face in future if their meat consumption increases dramatically. Of course, other arguments against eating meat or using animal products have been around for a long time, well before global warming and climate change appeared on the scene. Various religious and philosophical traditions believe that humans should not kill, maim, torture or exploit fellow beings for food or other purposes. But kill, maim, torture and exploit we do. Take chickens as just one example from the many that we could take. For the past half century, there have actually been two kinds of chickens — broilers and layers. They have different bodies, engineered for different ‘functions.’ Layers make eggs and broilers make flesh. Over the past 50 years, they have been engineered to grow more than twice as large in less than half the time. Chickens once had a life expectancy of 15 to 20 years, but the modern broiler is typically killed at around six weeks. Their daily growth rate has increased roughly by 400 per cent. All male layers in the US, comprising more than 250 million chicks a year, are destroyed. Most are destroyed by being sucked through a series of pipes onto an electrified plate. Some are tossed into large plastic containers. The weak are trampled to the bottom, where they suffocate slowly. The strong suffocate slowly at the top. Others are also sent fully conscious through macerators. So, if global warming isn’t enough to make people think twice about going vegetarian or reducing their meat consumption, the cruelty we inflict on other species may well do. In many respects, thanks to its various traditions, India has a definite head start when it comes to not eating meat. This is just as well considering 17 per cent of the global population live here on a mere two to three per cent of the planet’s land, and the country is already facing water shortage issues and dwindling wildlife habitat. According to a 2006 State of the Nation Survey, 31 per cent of Indians are vegetarians, while another nine per cent consumes eggs. India also has a system of marking edible products made from only vegetarian (non-animal) ingredients, with a green dot in a green square. But let’s not get too carried away and place all our focus on meat production. The heavy dependence on fossil energy suggests that the modern food system, whether meat-based or plant-based, is generally bad for the environment. During the last century, a radical shift took place in the world’s food system. We went from a sustainably based, localised food production to a fossil-fuel addicted industrialised system. In fact, agriculture has changed more in the past two generations than it did in the previous 12,000 years. Almost every aspect of the modern industrial agriculture creates greenhouse gas emissions. Author James E McWilliams suggests that many people recognise this impact and have turned to meat, dairy and eggs from non-industrial sources. The last decade has seen a surge in grass-fed, free-range, cage-free options. These alternatives typically come from small organic farms which practice more humane methods of production and at least appear to be more in harmony with nature. While Vandana Shiva notes the hugely negative environmental impact of modern meat production, she elucidates further by arguing that it is modern agricultural practices per se that must change. In this respect, the issue goes far beyond meat consumption and selecting a happy-smiley veggie meal at McDonalds or from the supermarket fast-food freezer in the belief that we are doing ourselves and the planet some good. Consider the fact that the next time you eat a meal of rice and vegetables, you could be taking in more than 40 times the amount of pesticides that an average North American person would consume for a similar meal. India is one of the world’s largest users of pesticides. Lady’s finger, cabbage, tomato and cauliflower in particular may contain dangerously high levels and fruits and vegetables are sprayed and tampered with to ripen and make them more colourful. Research by the School of Natural Sciences and Engineering at the National Institute of Advanced Studies in Bangalore reported in 2008 that many crops for export had been rejected internationally due to high pesticide residues. Shiva argues that this type of intensive chemical-industrial agriculture, with its reliance on vast amounts of fresh water, fertilisers, pesticides and the like, is destroying biodiversity and contributing towards climate change, not just in India but worldwide. It might have increased food production in the relative short term, but it has been at a terrible cost to the environment and is ultimately unsustainable. Modern industrial farms rely on fossil fuels, from powering machinery to petroleum-based chemicals used to create artificial soil fertility, protect against pests and stave off weeds. It is this use of fossil fuels on farms and the manufacture of fertilisers and other agricultural chemicals that negatively impact the environment. For Shiva, the answer is to return to basics by encouraging biodiverse, organic, local food systems. She argues that small, biodiverse, organic farms, especially in less developed countries, are totally fossil fuel-free. Energy for farming operations comes from animal energy and not machinery or the fertilisers manufactured down at the local polluting chemical factory, and soil fertility is built by feeding soil organisms via recycling organic matter. Making the required shift away from modern farming practices could be a lot easier said than done, however. Huge, politically connected and often extremely unscrupulous agribusiness concerns involved in fertiliser, pesticide and seed manufacturing (and let’s not forget the genetically modified sector) have a lot invested in maintaining the current, highly profitable system. In finishing, let us end where we began — with meat. Author James E McWilliams raises the all-important ethical issue by saying that it’s not how we produce animal products that ultimately matters, it’s whether we produce them at all. The dilemma he raises leads to some deep seated questions about how we as individuals personally regard our mass slaughter and wholesale exploitation of the living creatures we share this planet with. Even if our consciences can continue to live with this, the evidence is that, in the long run, the planet certainly can’t. It’s a known fact that vegetarian diet helps fight cancer, but a new research suggests that plants may protect us from cancer in a far more novel way – they may block a cancer’s ability to grow. Populations that consume less animal food and more plant food have a lower risk of cancer and the risk of cancer in vegetarians is about 50 per cent lower than among people who eat meat on a regular basis. Plant foods are high in antioxidants, and antioxidants can protect DNA from damage that can lead to malignant transformation. As per the new study, vegetarian food can block cancer’s ability to grow via a process called angiogenesis, a tissue’s ability to grow new blood vessels, reports the Age . If the process of angiogenesis goes awry, new blood vessels don’t form when they are needed, or blood vessel formation continues out of control. Researchers have developed some drugs that can help to shrink tumour growth or even reduce the spread of cancer by inhibiting angiogenesis. Scientists like William Li, a researcher who heads the Angiogenesis Foundation in Cambridge, Massachusetts, are looking at the power of certain foods to block angiogenesis. The plant chemicals in the foods like apples, oranges, blackberries, vegetables like tomato pumpkins etc. seem to be able to inhibit angiogenesis so that a single cancer cell or cluster of cancer cells is never able to grow enough to cause any mischief. Some plants also contain tumour-suppressor proteins, which help to curb the growth of cancer cells. Studies in the past have shown that men who eat cooked tomato products two to three times a week reduce their prostate cancer risk by about 50 per cent. Up to 35 per cent of cancers may be caused by poor diet, and cancer risk is also much higher among people who are obese.